Design a label in minutes, click a button in SAP, and never worry about it again. “Label printing must reliably perform its tasks and adapt to changes in the production system it supports.” This seemingly obvious statement heard in most SAP-run enterprises should be a guiding standard of the labeling infrastructure. Instead, it is said as an elusive goal by technical staff that spends entirely too much time and money on inefficient label printing operations. It is hard to immagine how such crippling dependence on slow and costly processes has persisted in a sensitive and dynamic development operation. Research of practical cases shows that these are just a handful of issues which can be solved by an efficient device controller that gives the user control over his operations. Move beyond the constraints of complicated and cost-intensive labeling operations that limit your flexibility and efficiency. Tackle the labeling system from within, using the stable and powerful SAP platform in combination with a straight-forward and user-friendly device controller to receive the best possible labeling results in the shortest time. NiceLabel is recognized as user friendly and comprehensive software to meet any labeling need regardless of the company size, knowledge and system complexity. The latest research shows that it is the best among strong competition of worldwide known labeling software. We understand that labeling is much more than just design. It has to be both, simple to use and operate with, and of course, it has to have the highest quality in terms of design. Different people from different environments are involved in the process. One application can not meet all their needs. This is why NiceLabel offers a modular solution that seamlessly fits into your existing system. 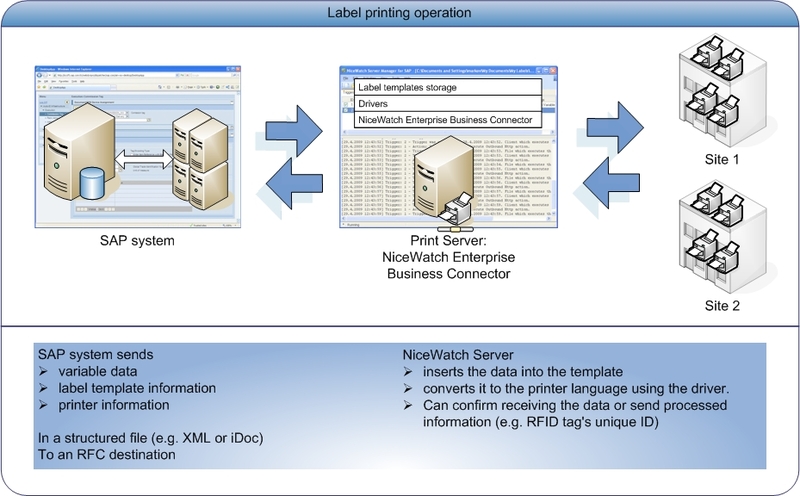 NiceWatch Enterprise Business Connector by Nice Label is the SAP certified device controller that was designed to solve problems of the SAP-run enterprises, but also those of the SAP integrators installing and maintaining the systems. It completely removes any need for programming and it’s use demands virtually no special knowledge or skills beyond those expected by the average Windows application. It is installed in easily to comply with any SAP ERP infrastructure, works with all printers seamlessly, and is easy enough for the enterprise to manage on a daily basis.